I guess it’s not just Sony stuck with the weird naming conventions as Nintendo announces the arrival of it’s next generation console, the Wii U. The new console breaks free of the Nintendo Wii’s SD graphic shackles and puts the console company smack dab in HD territory. Yes, Nintendo is finally doing HD. Other Controls: Up to four Wii Remote™ (or Wii Remote Plus) controllers can be connected at once. The new console supports all Wii™ controllers and input devices, including the Nunchuk™ controller, Classic Controller™, Classic Controller Pro™ and Wii Balance Board™. Props to Nintendo on backward support! The Wii console supports all existing Wiimotes and Wiigames. I’m just hoping we get upscaling like what Sony did on the first generation PS3s with Ps2 backward compatibility. As for the new controller? The controller features a large, touch-capable screen, paired with two circle pads, a directional pad, face buttons, a camera, a gyroscope and an accelerometer. Nintendo is positioning it as an entertainment sharing device, with video and gameplay working across the controller and your home console. Do note that the controller is not a handheld, meaning you can’t take it to work with you and expect to play anything. Any processing done on the controller is offloaded to the Wii U console. Oh, did I mention that the controller does video calls too? 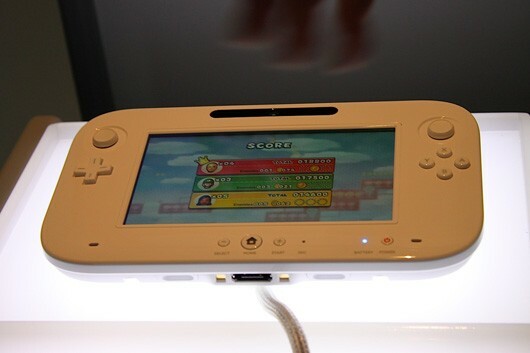 The Wii U is set to launch in 2012. Keep tuned in as more info as it streams via E3.